The Ice Queen lives in a frozen wonderland and she has the power to give you big wins. Beyond the reels, you can see her frozen home. High up in the mountains, the Ice Queen dwells amongst the snow and ice. It’s night time in the mountains and the Ice Queen’s home looks gloomy. However, it’s a magical frozen world that comes to life once you start spinning the reels! Her snowy owl and her sleigh are residents of the reels themselves, along with many icy symbols. In total, there are 12 unique symbols on 5 reels. Ice Queen doesn’t have traditional paylines and instead has 243 ways to win. This means that any symbols that land from the left and match up on at least three reels (consecutive reels) will pay! 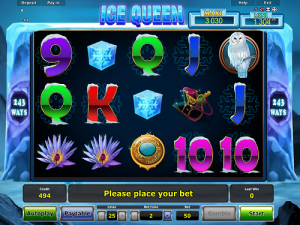 Ice Queen is a slot made by Novomatic and has an average RTP for this developer – standing at 95.05%. Familiar features are built-in to the game, such as Free Games, Autoplay and Gamble. Other Novomatic slots with a similar theme or style to Ice Queen include: Summer Queen, Dragons Deep, Fairy Queen, Lord of the Ocean, Spring Queen and Queen of Hearts. Ice Queen also has two mini jackpots that can be won during the free games round. Card symbols show up on the reels and make up the bulk of the symbols. They have the smallest payouts and include the values: 9 (purple), 10 (pink), Jack (blue), Queen (green), King (red) and Ace (yellow). When it comes to the picture symbols in Ice Queen, these are all based on the theme of the game. The lowest-paying picture symbol is the Ice Queen’s sleigh. Then there’s a beautiful purple flower that presumably blooms only in these snow-capped mountains! The Ice Queen’s brooch is the next highest-paying symbol and her snowy owl gives out the biggest wins of all the normal symbols. This Novomatic slot game doesn’t have paylines. Instead, any of these symbols can pay out in any position! Any set of three, four or five matching symbols will give payouts if they land on reel 1 (the leftmost reel) and then subsequently on adjacent reels, moving towards the right. Autoplay can be enabled at any time but note that, if the game is in this mode, no settings can be changed and no wins can be gambled. You can increase or decrease the amount you want to bet by using the buttons underneath the reels. Here, you’ll also find the paytable button. The paytable displays the games rules, payouts (these will update with your bet) and other information. The gamble and autoplay buttons are also found at the bottom of the screen. On top of these ‘ordinary’ symbols, there are two extra symbols! These are the Bonus symbols and the Wild symbols. The Wild symbol is the Ice Queen herself and she has the power to substitute for any of the ordinary symbols (including the card values and the picture symbols). Any win that’s given where she has acted as substitute will also award 2 Free Games! The Free Games are played on the ordinary reels and allow you to make the reels spin twice without you having to spend your bet. The Bonus symbol can’t be substituted by the Ice Queen Wild. This is a frozen ice cube symbol, containing a precious snowflake! When the reels spin and stop with at least three ice cube symbols on them, the game will activate the Cubes of Fortune feature! This feature gives you 8 Free Spins but these Free Spins aren’t played on the normal reels. These are played on a separate set of reels! Each spin, there are 5 ice cube Bonus symbols on the screen and they will melt one by one. If the snowflake inside stays intact, you will get a win. This win amount will increase with every snowflake that stays intact. Three will give the mini jackpot and four will award the maxi jackpot. If the first four ice cubes all melt and so do all of the snowflakes within, the fifth ice cube may award 3 additional games!